This rayon T is super-soft and comfy. 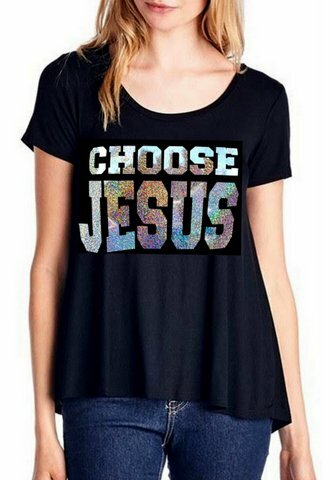 Made of 95% Rayon and 5% Spandex, this flowy t is figure-flattering with the bold statement of Choose Jesus in the front, and Be Saved with a heart surround on the back. 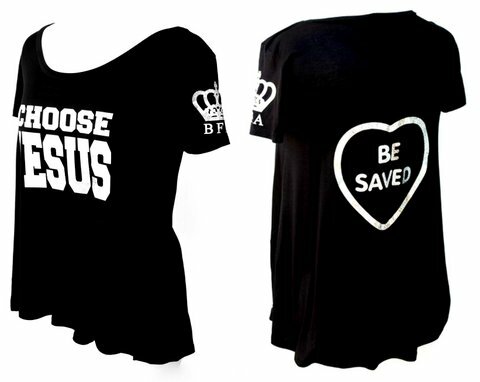 The side arm features a crown with BFA which stands for Beauty for Ashes. Sizes S-L are slightly hi-low. All design is a silver holographic with a rainbow sheen, super sparkly!